2 Years was the youth tournament “Cologne Junior Cup” very successful. Now, 2019, it’s named “European Junior Open”. It will start at the 4th of July and will end at the 8th of July at ACR Sport Center. All informations you can find on this homepage. Look for “European Junior Open” or click here. Please send this information to all young squash players you know. Thank you! 2 Jahre war das Jugend-Turnier “Cologne Junior Open” sehr erfolgreich. Ab diesem Jahr ist es umbenannt in “European Junior Open”. Es beginnt am vierten Juli und endet am achten Juli im ACR Sport Center. Alle nötigen Informationen gibt es auf dieser Homepage. Schaut nach der Rubrik “European Junior Open” oder klickt einfach hier. 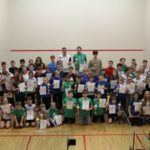 Diese Information bitte an alle jungen Squash-Aktive senden, die ihr kennt. Vielen Dank! COPYRIGHTS 2019 © Squash Landesverband Nordrhein-Westfalen e.V.